Our personalized engraved crystal glass paperweight is a perfect gift that can be displayed by itself or on a display stand to show off your sports pride. The engraved crystal paperweight can be on display on a desk, bookshelf or table with our add-on display stand. Personalize your own glass paperweight for that special someone to make for the perfect gift for any occasion. PERSONALIZE YOUR CRYSTAL GIFT! Our Engraved Personalized Icon Crystal Award is the perfect gift for hardworking attackers, midfielders, defenders, and goalies. 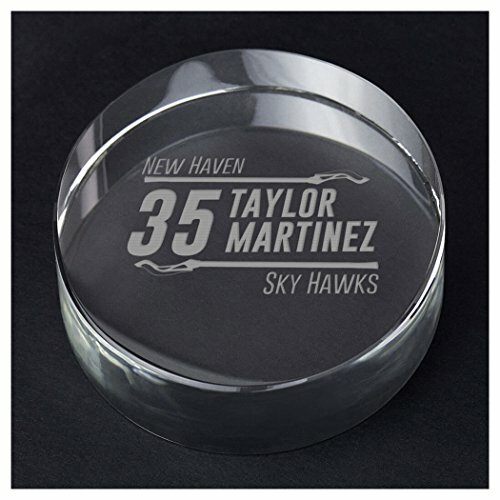 Personalized with your player's name, team name and number, these crystal paperweights are the best way to show team pride at the end of a winning season! The Engraved Crystal Gift is an excellent award and gift idea for the entire team! GOAL! Was your player named MVP? Did they have the best season of their lacrosse career? Personalize our Engraved Crystal Personalized Icon to award them on their career or season goals! Any youth, teen, or adult player will be excited to receive this team award! DISPLAY YOUR PRIDE! After a hard and successful season on the field, allow your players to show off their accomplishments! These personalized gifts are a perfect addition to display in a kid's room, on a desk, or on a bookshelf! Everyone on the team will want their own! TEXT WILL BE PRINTED AS IT IS SEEN ON THE PRODUCT IMAGE ON THE DETAIL PAGE TO THE LEFT, THE CUSTOMIZE NOW VIEW MAY DIFFER FROM ACTUAL PRODUCT. ENGRAVED IN THE USA! Made from solid polished crystal, weighing 13.5oz., and measuring 3"x1", this Personalized Engraved Crystal Gift is an excellent way to show your team pride! Each Crystal Gift is engraved on the back allowing your customization to show through crystal clear! Our Crystal Base Stand and Gift Box are perfect additions to display our Engraved Crystal Gifts. The Crystal Base Stand and Gift Box can be purchased separately from ChalkTalkSPORTS. DESIGNED AND SOLD BY ChalkTalkSPORTS - A USA based, family owned and operated business located in Connecticut. We pride ourselves on the integrity and quality of our products and firmly stand behind all that we sell. If you are not 100% satisfied with your purchase, please contact us so we can make it right.